So, I bought a Kenwood Ice Cream maker at the beginning of the year, and have been having lots of fun with it. My first few attempts stuck closely to the recipe (get the basics right first, no? ), and were mainly Philadelphia style (ie. eggless) ice creams. These were mainly cold mix recipes that had no cooking (or eggs) involved. A couple of batches later, I thought I had gathered enough confidence to try making my first custard based Rum and Raisin ice cream. Eggs! Heat! Stirring! Being a somewhat paranoid cook, I was a little nervous. But it turned out quite well, and after a few more custard ice cream attempts, I became brave enough to start experimenting with random ingredients around the house. Cue – Earl Grey Raisin Ice Cream, with a fragrant milk tea ice cream with raisins that oozed strong bergamot goodness at every bite. I paired them with Chocolate Marie Biscuits to make ice cream sandwiches. And they were delicious. Heat the milk, sugar, 1 cup of the cream, salt and knotted pandan leaves over medium-high flame in a medium saucepan. Stir to dissolve the sugar. When the milk begins to steam, remove from heat. Leave the pandan leaves in the cream. Cover and steep for 30 minutes. Whisk the egg yolks in a medium bowl. Slowly ladle some of the cream mixture from the saucepan into the egg yolks while whisking continuously. Pour the warmed egg mixture back into the saucepan mixture and set over medium heat. Constantly stir the custard with a heatproof spatula, remembering to scrape the bottom and sides to prevent eggy bits from forming. The custard is ready when the mixture begins to steam and thicken, and you can run your finger across the custard coated spatula without the layer flowing back together. Remove from heat and strain into the cream. 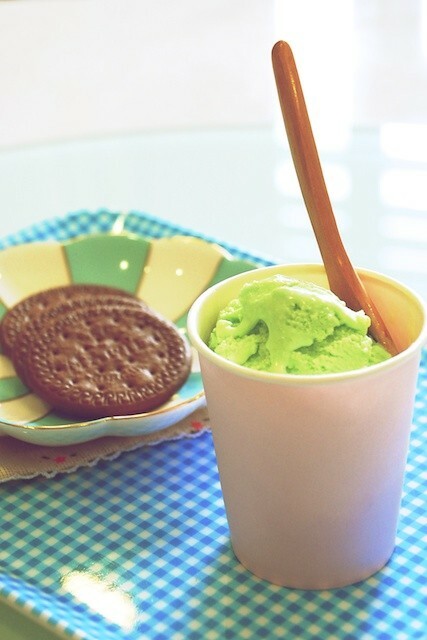 Mix in the pandan extract until well-blended, and stir mixture until cool over an ice bath. Let the custard cool and then refrigerate for at least 8 hours until it is completely chilled. Churn in your ice cream machine per the manufacturer’s instructions. While mixture is churning, place the Pandan Fudge Cake in a bowl and smash cake into small bits. Make sure fudge and cake are mixed thoroughly together until the mixture resembles a ball of sticky chewy paste. Once ice cream is churned and ready, remove from machine and stir in smashed cake mixture, mixing it well into the cream. Finally, freeze the mixture for a couple more hours in your freezer… and voila! 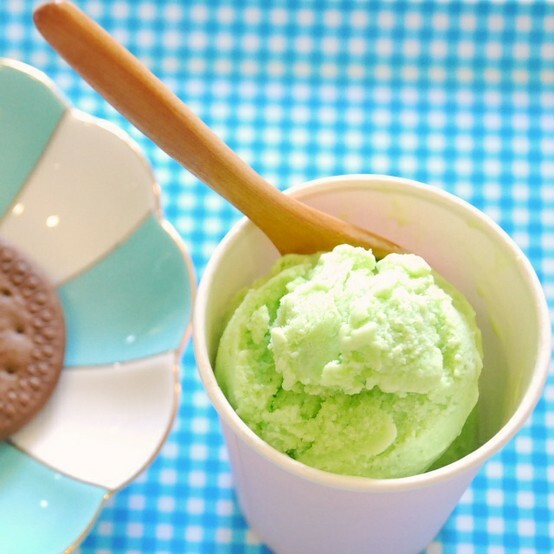 Fragrant, green, sticky chewy Pandan Cake ice-cream! I’m not a big fan of Pandan Fudge Cake in general – having had too much of them at my elder relatives’ birthday parties, but I have to say, this was one experiment that came out quite delicious. Next Post Review: Why Weeps the Brogan?